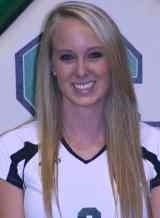 Seward has a second straight KJCCC Player of the Week in volleyball. Courtney Geesing led the Lady Saints to a 4-1 week including a huge Jayhawk West Conference opening win against #14 Pratt in the Greenhouse Wednesday night. In that match, the 5’10” outside hitter from Montrose, Colorado recorded her first career double-double with 10 kills and 15 digs. She continued to pile up the numbers this weekend in the Redlands Labor Day Classic, helping Seward to a 3-1 record with wins over Paris, Hutchinson, and Hill. She had 13 kills against both Paris and Hutchinson and recorded 8 or more digs in every match. She finished the week hitting .361 with 2.68 kills and 2.63 digs per game. Seward is 7-2. Sheina Fernandes won the award last week. Seward hosts Cloud (1-10, 0-1) Wednesday night at 6:30 p.m.